The Customize Windows > Computer and Internet > Cloud Computing > What is Machine to Machine (M2M) Communication in IoT? The concept of machine to machine communication is to enable communications between machines without human intervention. Machine to Machine (M2M) Communication is a part of Internet of Things (IoT). Previously, we have talked about the Protocols related to Internet of Things (IoT). With so-called smart, communicating ‘Things’ this way provide them the means to interact without human intervention with the information system. It may belong to either an organization or a company. Like all emerging technologies, Machine to Machine’s definition continues to evolve, but it usually refers to telemetry or telematics. This technology works by using networks, especially public wireless networks (such as GPRS) or shorter spectrum methods, such as Bluetooth or RFID. The notion of connected devices on a local network is that, the latter being connected to a data-hub that acts as a gateway to the databases of large central servers or to cloud. Communication between machines is becoming a communication of a machine or a network of machines to a server centralizing data reported by these machines and also, a way of providing remote control of the machines. This is known as remote management of a fleet of machines (remote devices management). A device or group of devices capable of responding to requests for data in those devices or capable of transmitting data in these autonomous devices. A communication link to connect the device or group of devices to a host computer or other device. Software, processes, or interface through which data can be analyzed, reported and / or implemented. Most often, the M2M systems have a specific task, that is, these systems are designed for a specific device, or a very narrow category of devices. Provision for “hardware-agnostic” industrial infrastructure software that enables devices from different suppliers to receive the same software or service. For example, Oracle , IS2T, STMicroelectronics offer such infrastructure based on Java virtualization technologies in electronics and in gateways or data-hubs. The potential market for M2M in the billions of machines and hundreds of billions of objects that can be interconnected. In 2004, the number of M2M modules was 92 million units, counting all the network technologies. That number could exceed 900 million in the 2015. Moreover, the fact of using mobile networks ( GPRS , UMTS or LTE ) represents a new market for the mobile operators. They are particularly useful for accessing smart meters (water, electricity) located throughout a country, or to connect mobile devices such as GPS or radar alarms. This Article Has Been Shared 6129 Times! Articles Related to What is Machine to Machine (M2M) Communication in IoT? Glucometer can be an easiest example of potential Smart Object and also it can explain why not all can be part of Internet of Things. 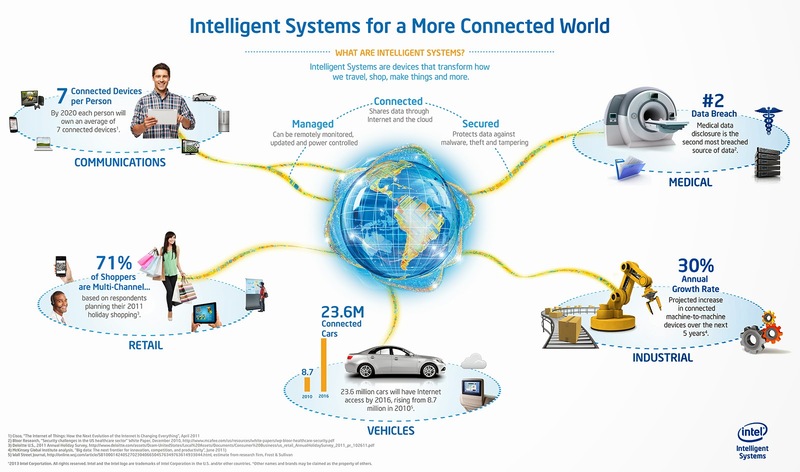 Title: What is Machine to Machine (M2M) Communication in IoT? Cite this article as: Abhishek Ghosh, "What is Machine to Machine (M2M) Communication in IoT?," in The Customize Windows, September 10, 2014, April 21, 2019, https://thecustomizewindows.com/2014/09/machine-machine-m2m-communication-iot/.